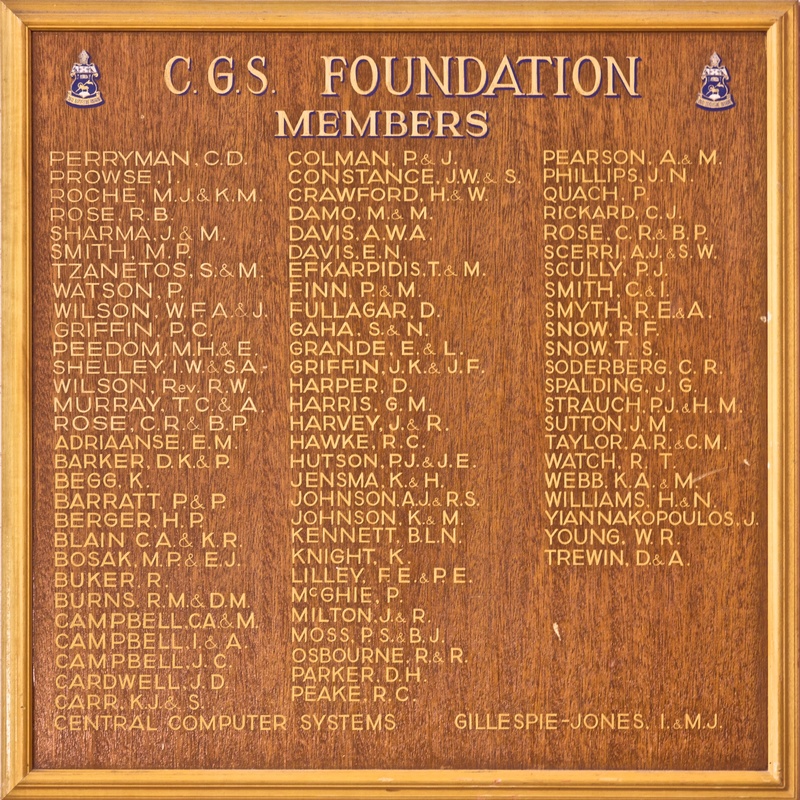 The original Canberra Grammar School Foundation was launched in 1979 and soon supported construction of the Senior School Science facilities, which opened in 1983. Thereafter, the Foundation’s capital campaigns made major contributions to maintaining and developing the facilities of the School throughout the 1980s and 1990s. 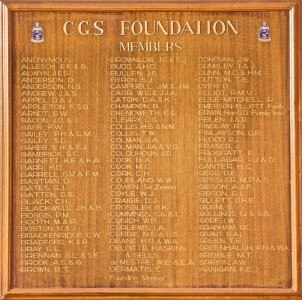 Projects supported by the Foundation in this era included conversion of the former Library to the CGS Gallery, improvements to the Boarding Houses, refurbishment of the Art, Design and Technology Centre, landscaping around the Resource Centre, and the renovation of the War Memorial Hall and Dining Hall. The Foundation also supported extension of the Music Department, construction of the International Centre and the PDHPE Centre, and installation of the Peace Window in the CGS Chapel. 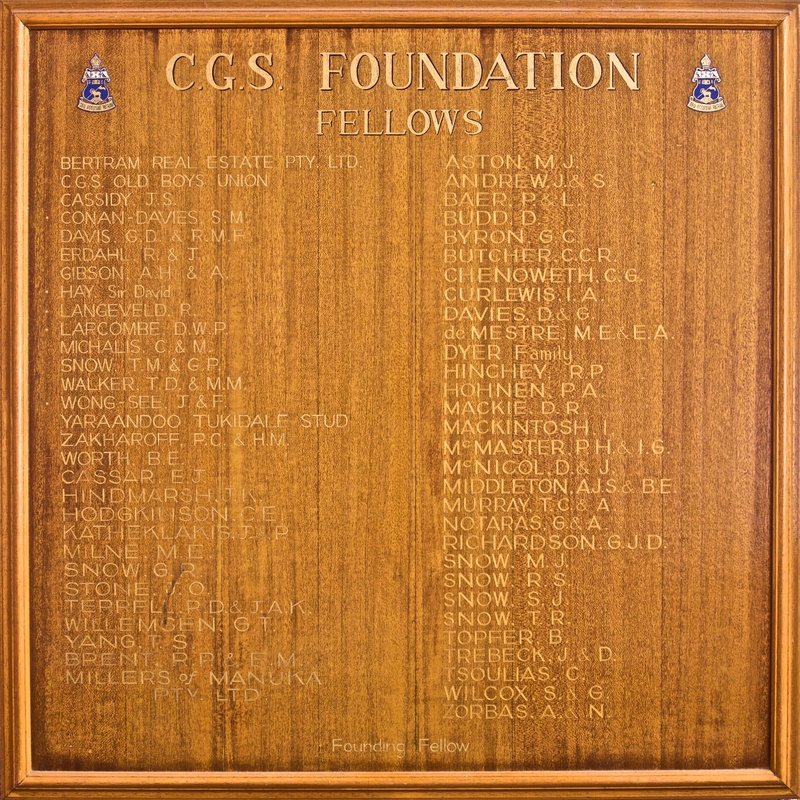 Campaigns by the first Foundation also saw the establishment of numerous scholarships and bursaries, notably the Paul McKeown Scholarship, recognising the enormous contribution to the School of its longest-serving Headmaster. In 2003, the original Foundation’s funds were transferred to the School’s investment portfolio and the School took over the funding of scholarships, backed by its investments. In 2013, the new CGS Foundation was launched to provide an active and forward-looking vehicle for community engagement and philanthropy. It incorporated the funds of the original Foundation and its spirit was ignited by the extraordinary gift of $8 million by former CGS student, Mr Terry Snow, one of the largest single donations to any School in Australian history, for the creation of The Snow Centre for Education in the Asian Century. 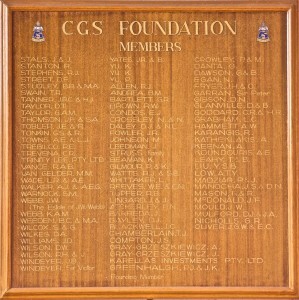 Since its re-inception, the CGS Foundation has become the repository of the School Renewal Charge, paid by all families on acceptance of enrolment to the School, and it has grown through annual giving campaigns, through the campaign for endowment of the Robert Poate Scholarship for Leadership, and through the exceptional deed of gift of more than half a million dollars by the outgoing CGS Old Boys’ Association for creation of the Old Boys’ Association Scholarship. The original Foundation was launched in October 1979 and incorporated in December 1979. A Membership campaign was launched on 13 February 1980. By June 1981, $73,620 had been received in donations. The first major building project to receive support from the Foundation was the Senior Science Building due to open in 1983, comprising Physics, Chemistry, Geology and Biology laboratories. The project was budgeted at $350,000 of which the Foundation’s initial promise towards construction was $105,000 with the hope to be able to contribute more. By 8 March 1983, the Foundation could boast 191 Members, 10 Fellows, 3 Trustees and received donations of $205,864. During 1984, the Foundation received a request from the School Board to launch a major appeal for capital contributions to help in maintaining and extending the fabric of the School. The appeal received support from 81% of parents and donations totalled over $228,586. Also in 1984, the first annual scholarship was awarded thanks to funds donated by Dr Athol Tymms in memory of his father. The Foundation also sponsored an Artist-in Residence programme. In 1985, the Commonwealth Government implemented a new finance support model for schools and, for private schools, was based on their location’s socioeconomic profile. Canberra Grammar School was substantially disadvantage by the model, putting pressure on the School’s finances. The aim of the Foundation was to rise to the challenge and develop a strong and dynamic Foundation to assist the future of the School. By 12 March 1985, $356,342 had been received by the Foundation. Total funds contributed to the School for the Senior Science Block now totalled $200,000.The 1985 Appeal raised $270,000. Total contributions to the Senior Science Block were now $250,000 and a further $20,000 was contributed to the Eddison House Building Appeal. The Foundation was in in receipt of some funds from the first ever Bequest to the Foundation, from the Professor Burton Estate estimated to be in excess of $100,000. The first grant from this bequest was made to Rev. Bill Stegmann to allow him to undertake Staff Development Training in Religious Education. As at 6 March 1986 a total of $445,155 had been received in donations. The Tymms Scholarship was again awarded and advertisements were placed for students to sit an exam for the first of the McKeown Scholarships to be awarded in 1988. The Foundation had made donations to the School totalling $300,000 and the 1986 appeal raised in excess of $350,000. In March 1988, the Foundation Board reported an investment portfolio of $1,347,000. The scholarships funded included the Tymms, Barratt Music and McKeown scholarships. There were plans for a major capital fundraising campaign to assist with the funding of Stage 1 of the Resource Centre, a new maintenance shed on Golden Grove and a Boarders’ Common Room. The Building and Education Fund receipts for 1988 totalled $671,908. A donation was made to the School of $150,000 to complete the Senior Science Block, $98,200 to mortgage repayments and $500,000 for the Maintenance shed and Boarders’ Common Room. $14,108 was committed towards staff development and the Tymms, Barratt and McKeown scholarships were also funded. 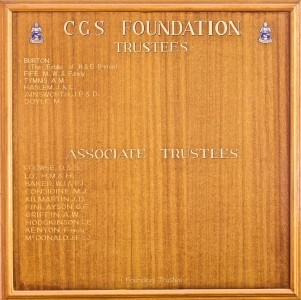 In 1989 the above scholarships were again funded by the Foundation. Total funds held by the Foundation were $1,892,186. The School requested the Foundation fund a four year plan for building and upgrade for 1990 to 1993. 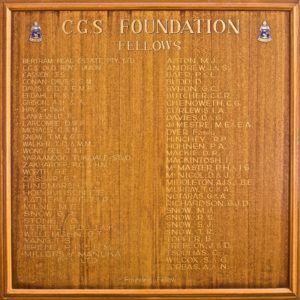 By 1990 the Foundation had 367 Members, 59 Fellows, 11 Associate Trustees and 6 Trustees. A year 12 Common Room, The Gallery, and a home for the Drama Department had been created in the vacated Library space. The two boarding houses were completely redecorated with new cubicles, curtain, carpet and paintwork. Landscaping had been completed around the new Resource Centre and work had commenced on the refurbishment of the Craft Centre. This activity took its toll on the corpus of the Foundation. From the Education Trust Fund, $30,000 was spent on Educational Development. In December 1990 the Foundation decided to forgive loans to the School totalling $1,450,000. In 1991, the Foundation agreed to fund a renovation of the School War Memorial Hall, enclose the area between it and the Dining Hall to create a covered foyer and extend the Music Centre. This project was a major part of a larger project to open up the upper level of the cloisters so that there is an unimpeded concourse around the top of the Quadrangle. This project was to further deplete the Foundations Building Fund. The Foundation continued to fund bursaries, scholarships and staff development grants were awarded. 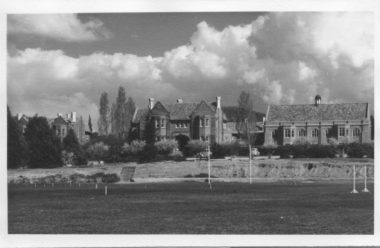 By December 1992, the Music Centre extension and the Foyer adjacent to the War Memorial Hall were complete the Foundation embarked on a fundraising campaign to raise in excess of $400,000 to underwrite the cost of the planned International Centre and extensions to the Junior School. In 1993 the International Centre was completed. The Education Fund administered by the Foundation was boosted by a one-off donation from the School of $184,000.The Foundation contributed $252,000 to building-related expenditure in the School such as minor capital projects and building maintenance. One of the larger contributions to Foundation funds over the years was from voluntary contributions from parents to an Annual Building Contribution (ABC) that was set up, at the request of parents, in the early 1980s. Possibly due to economic circumstances, contributions to the fund had declined and despite an increase in the individual contribution and a 6% increase in total contributions, it was not enough to justify the continuation of the programme so a decision was taken by the School Board in 1993 to terminate the ABC and make appropriate adjustments to School fee levels. 1994 was a year in flux. Long standing Foundation manager, Mr Bill Wilson was to leave at the end of Term 1 and replacement, Adrian Keenan was to commence later in the year. 1994 was the final year for ABC contributions and saw the Building Fund grow from $740,000 to $1,200,000 however the financial future of the Foundation came into question. The loss of around half a million a year flowing to the Foundation from the ABC forced a complete rethink of the Future of the Foundation throughout 1995. A concept termed Total Development was created. 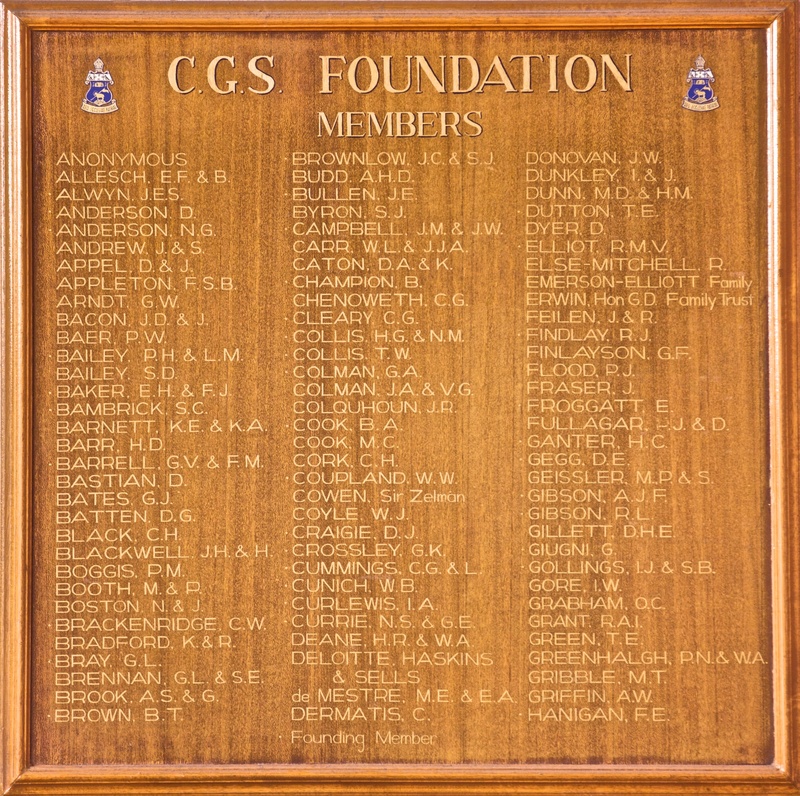 The concept combined the Foundation with the School and a Development Team was formed incorporating CGS staff, Foundation Chairman, P&F President and the President of the Old Boys Association. During 1996, the Foundation helped fund the Peace Window, the Multimedia Centre and contributed $57,000 towards the Health & Physical Education Centre. The Foundation also contributed $40,000 to fund a range of projects covering staff development for over 40 staff members, visiting experts programme, bursaries and education equipment. From mid-1997, the Foundation adopted the Total Development model and took on more of a support role for School events such as the 70th Anniversary of the School. The out-going Head Master was of the opinion that he should not commit to new projects that may be in conflict with the vision of the in-coming Head. The Foundation continued to assist with the funding of the Peace Window and the Multicultural Centre. In 1998, the Foundation was pleased to assist the School with an interest only loan of $200,000 to purchase a property adjoining the Northside Infants School in Campbell. In the 10 years from 1990 to 2001, the Foundation contributed $461,364 from the Education Fund to assist the School. A large proportion of this went to professional development of teaching staff. Investment funds transferred from the Foundation to the School in 2003 totalled $2,157,125. These were preserved in the School Investment Portfolio and at the same time the School took over the responsibility of funding scholarship. In 2002 the School also took over responsibility for funding the various scholarships which had been previously funded by the Foundation. In the 14 year period since the Foundation funds were transferred to the School, the scholarships provided have grown to more than 40 annual scholarships – a number which would not have been possible had the backing of the portfolio not been available. 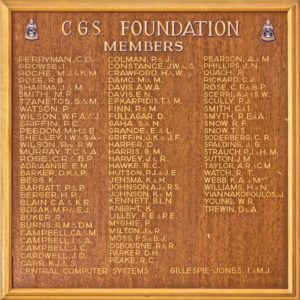 In 2013, a decision was made to reinstall a Foundation due to a need for an active and forward-thinking Foundation to facilitate community engagement and philanthropy at CGS. 2013 saw a framework for the Foundation taking shape. A key priority was ensuring the full transparency and accountability of Foundation operations, and the Foundation was set up as its own business entity, autonomous from the School, with its own constitution and independent Board. 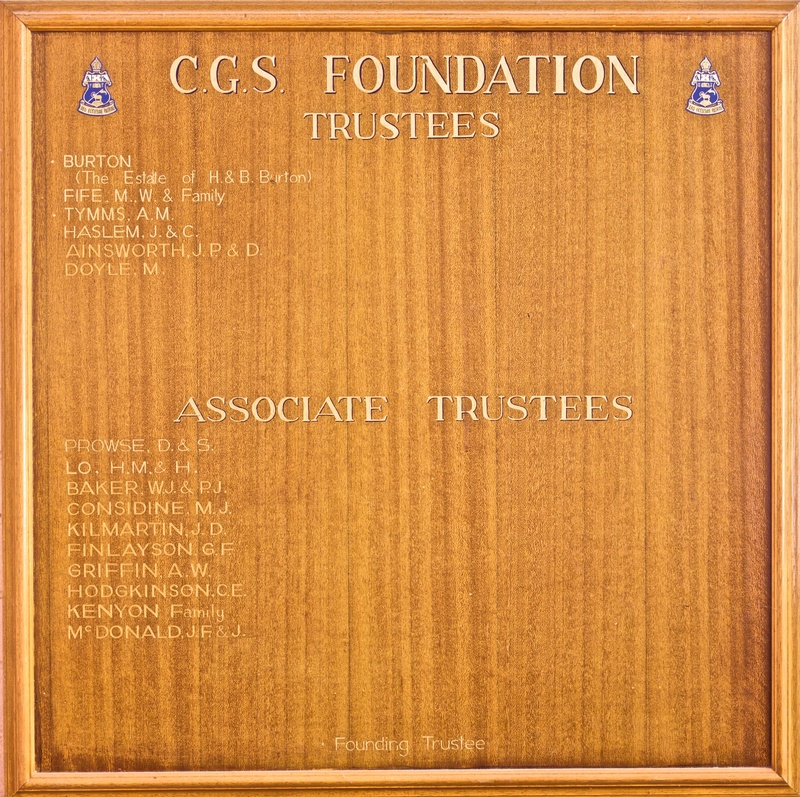 A mission and set of aims were developed by the Foundation Board to guide the fledgling Foundation in its activities and clearly define its purpose and role within the community of CGS. 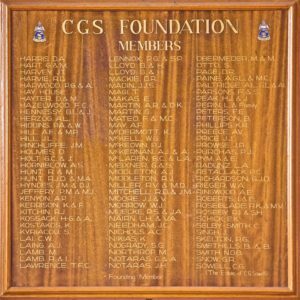 The first comprehensive and targeted annual giving campaign for the Foundation was held across June 2014 and beyond, with all proceeds directed towards the Campaign for CGS. Results were encouraging, with the campaign outperforming all prior years and bringing in a 50% increase in donors in 2014. The campaign also brought in a number of new Foundation Members. In August 2014 the Foundation hosted its first donor thank you event with a private viewing of Arthur Boyd – Agony and Ecstasy at the National Gallery of Australia. 2014 saw the Foundation developing a dedicated website for the CGS Alumni community. The website was launched in early 2015 and is designed to provide all Alumni with a dynamic and informative way of engaging with each other, and with the School. Related to this, in early 2015 the Old Boys Association (OBA) was in the process of proposing to wind up the Association and transferring to the CGS Foundation Scholarship Fund the corpus of funds it currently manages. This proposal was passed by special resolution at the CGS Old Boys’ Association AGM in May 2015, with a Deed of Gift to be developed and approved by the OBA in the remainder of 2015. The strength of community spirit was ignited further by an extraordinary $8 million donation from CGS Old Boy, Mr Terry Snow. This gift, one of the largest to any school in Australian history, established the Terry Snow Scholarship for Global Studies and has enabled the development of the Snow Centre for Education in the Asian Century. 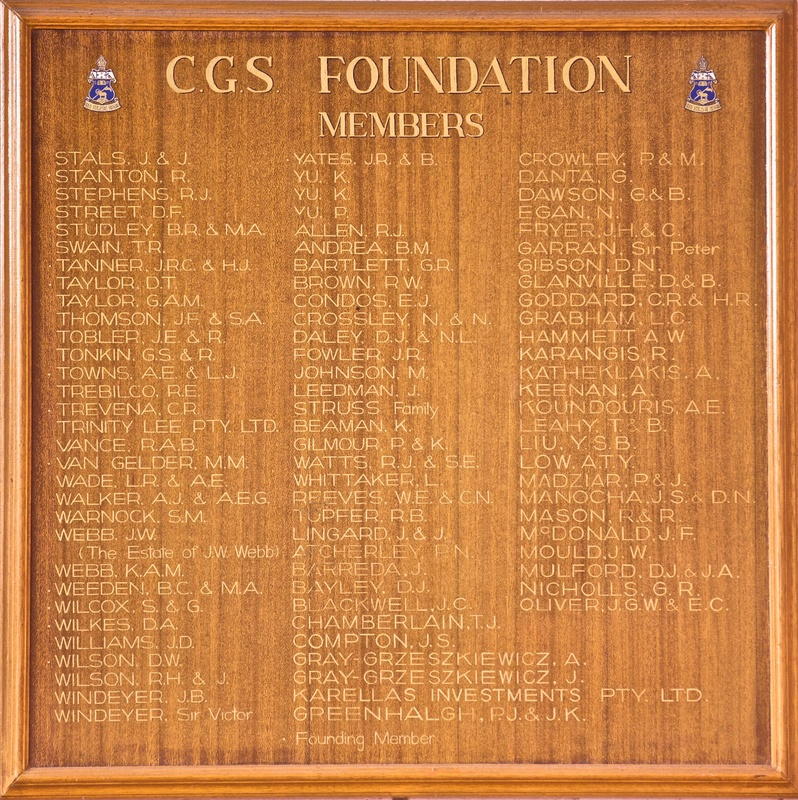 In March 2015, The CGS Foundation hosted a special evening function to thank CGS Old Boy Mr Terry Snow for his extraordinary generosity, and together with donors and key stakeholders, celebrated the opening of this state-of-the-art facility. Whilst always poised to support the School in achieving its vision of becoming a world-class leader in education, the Foundation is firmly focused on building the long-term prospects of Canberra Grammar School. With over $7M now held in Foundation funds, the strength of this growing corpus will be nothing short of transformative for CGS. 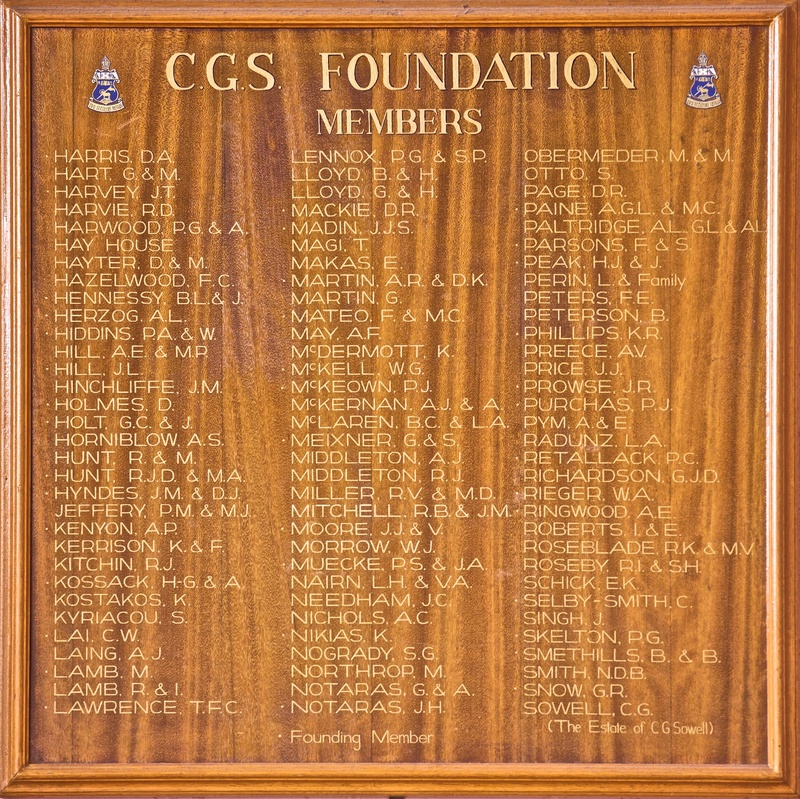 Much has been achieved in these first fledgling years of the new CGS Foundation and much more lies ahead. The Snow Centre now stands as a very visible and impressive display of what is possible when the kindness and generosity of our community and the Foundation come together, transforming the School’s educational aspirations into reality. It is this union that will be fundamental in bringing the untold potential of this School to fruition, and with it, unleashing the limitless potential of our students.